Mother of God Kardiotissa, Theotokos Icon orthodox, Religious icon of Virgin Kardiotissa with a child. The halo is crafted by hand. MINOR DIFFERENCES ARE POSSIBLE BUT YOU WILL BE PROVIDED PICTURES OF THE ACTUAL ICON YOU ARE RECEIVING. 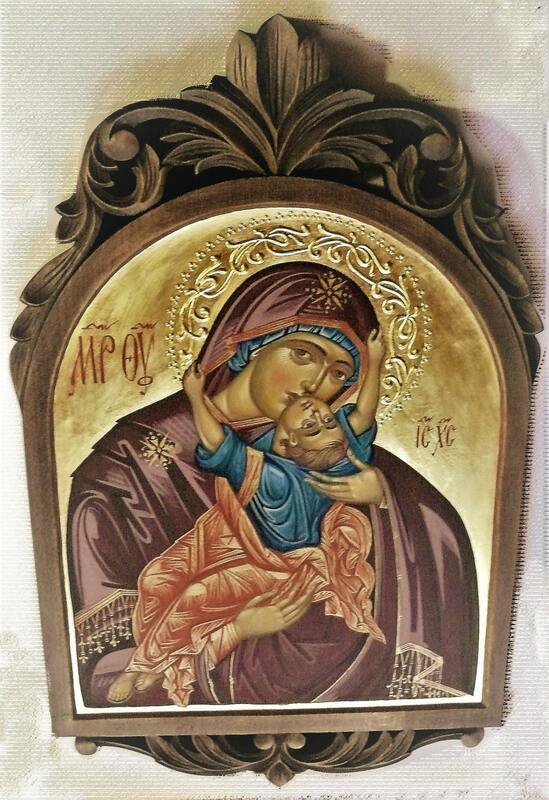 The images present to you this beautiful hand-painted orthodox icon created by Bulgarian artist Georgi Chimev. The icon is painted on a dry wood panel. The painting technique is called egg tempera. For the halos, and background icon, it was used gold leaves. The icon is varnished with a couple of layers to assure a long-lasting image and to make it easy and safe to clean it from dust. The back is varnished with darker tone semi-transparent varnish for a nice finish. egg tempera, dry wood panel, gold leaf, varnished finish for long-lasting protection. Without carved elements around : 25 cm x 30 cm approximately 9.84 x 11,81 inches. With carved elements around : 25 cm x 50 cm approximately 9.84 x 19,69 inches. Custom requests and orders are welcome! Please message us for details on the size and image! Beautiful beautiful beautiful. Thank you so much!